What are you still doing inside at this time of year? When the sun goes down and the light of the moon illuminates your backyard patio, that is the time to relax in the cool, fresh breeze instead of the indoor air conditioning. Whether you’re throwing a party or you’re paying bills, you can sit at your outdoor patio table. And whether you’re showing off your backyard to a friend or your showing off your backyard to a potential homebuyer, you want it to look as appealing and impressive as possible. To ensure that you spend as much time outside as your schedule allows, and to make sure your backyard looks as spiffy as it can, treat it like another room in the house. Decorate! •	Decorate your patio table like you would your dining room table. Decorate for the occasion, and have fun with it. For a tea party with neighbors, cover the table with a linen or lace tablecloth and keep it in place with a centerpiece of flowers. Fill a china bowl or wicker basket with fake or real flowers in soft, pastel tones. Place china or other types of classy dishware out at each setting. For a casual picnic with family members or friends, use a checkered tablecloth or a thin blanket. Place a basket of food items in the middle of the table, serve on paper plates with straw plates underneath to prevent them from blowing away, and place a couple pitchers of ice water or lemonade on the table. Decorate the table in a way that makes it look regularly used, and then use it! •	Create a wall of foliage. This way, you don’t need to worry about taking up space and making your patio look cluttered with pots, and the pots won’t be falling over in the wind. Also, it clusters everything together for easy watering. Purchase an abundance of cinder blocks, or unbury the ones you already have in your garage, and stack them up against the backyard fence or along one of the sides of your patio. Stack them with the holes facing upward and in opposite directions so that every other block is sticking out. Then, stick potted plants into the holes of the cinder blocks and enjoy the sights! Check out this picture of what HGTV refers to as a Living Wall for inspiration. •	Hang lights. Porch lighting just isn’t enough to create a homey ambiance that you’ll want to relax in. Unpack strands of white lights from your winter holiday boxes and wrap the lights around the pole to your table umbrella table, along the gutters on the back of your house, around the rims of your patio or around the balcony ledges of your deck. Hang oriental lampshades from your roof overhang, and consider adding stencil drawings or custom paint to the lampshades. Switch the bulbs in your porch lights to colored bulbs that correlate with an upcoming holiday. Stick tiki torches in your ground, preferably ones with citronella candles that will keep the bugs away. 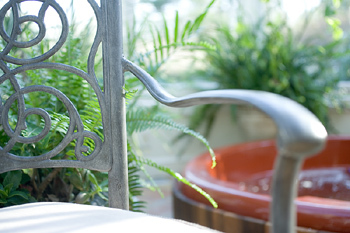 Take these ideas and use them in your own backyard, or come up with decorating ideas of your own! Decorating the outdoors with weatherproof décor will surely make you more apt to spend time outdoors, and it will increase the appeal of your house as a whole. After all, who doesn’t want an outdoor oasis to enjoy during this beautiful time of year?